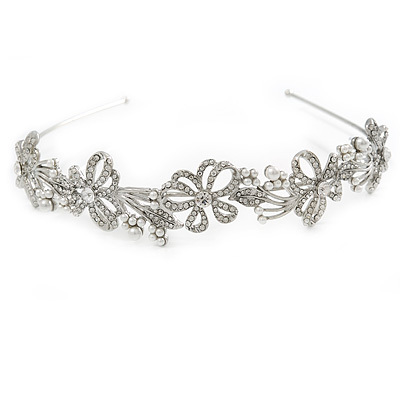 Fall in love with this romantic bridal tiara and sparkle on your special day. The band crafted in rhodium plated metal and has about 14cm Diameter, and about 22mm Height at it's widest point. The front section accented with clear Austrian crystals and white glass pearls. This stunning, flex headband will fit most wearers with ease. This would be perfect for that finishing touch to your dream wedding dress for that extra sparkle or for any other special occasion. It would also make an ideal gift - or just treat yourself!